Historical records clearly demonstrate that the Roman Poet Lucretius was a passionate believer in ghosts who devoted a great deal of time to investigating and researching claims of apparitions. He eventually gathered enough material together to propose the theory, commonly known as Lucretius's shell, which ghosts were a kind of shell, which diffused or splintered from the body of a dying person and lingered in the atmosphere after death, moving at will. This theory is considered the forerunner of theories regarding the possible existence of the astral body, which may separate from the body of a living being under altered states of consciousness, such as trance or deep sleep. 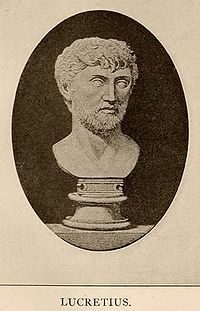 Lucretius is thought to have died raving mad from the effects of a love potion administered to him by his wife. Lucretius is thought to have not been so much as believing in ghosts as having attempted to explain the non-existence of the person after death. This seeming disconnection with the prior writing does have some explanation however. His death and dates of birth and death are also generalized and not specific, hinting at a more complicated existence and that the writings of him may be much more confused. Care must be taken in stating these things with certainty. His death was probably not a potion induced death and there are some indications it may have been something more sinister that claimed his life. "Lucretius himself, though by the course of his philosophy he was obliged to maintain that the soul did not exist separate from the body, makes no doubt of the reality of apparitions, and that men have often appeared after their death. This I think very remarkable. He was so pressed with the matter of fact which he could not have the confidence to deny, that he was forced to account for it by one of the most absurd un-philosophical notions that was ever started. He tells us, That the surfaces of all bodies are perpetually flying off from their respective bodies, one after another; and that these surfaces or thin cases, that included each other whilst they were joined in the body like the coats of an onion, are sometimes seen entire when they are separated from it ; by which means we often behold the shapes and shadows of persons who are either dead or absent." One could take this to mean that he understood the appearance of the ethereal body and perhaps interpreted this as not a continual form, but a continually ejected spirit, akin to leaving imprinted and whole copies behind as a human or animal moves through life. All in all, a considerably advanced theory for that time in history. In writing this article, I was not able to substantiate the term "Lucretius's shell" by which the first quoted article is based. Similarly, it would be useful to find more source information on where it was quoted that he held a passion for the topic or a actually conducted active investigations of the paranormal. It would seem reasonable that he would have discussed the matter with other intellectuals and perhaps witnessed or interviewed people who did experience these events. No matter what, it does seem that Lucretius is one of the early writers on the subject in Western literature. Some of the writings show that he was approaching the subject from a logical and scientific framework, despite the lack of formal definition of these at that time in history. More will be added to this article as information surfaces and perhaps we are illuminated by comments from readers with source information and resources to help with this. If Lucretius was working the theory that we have many layers and that they somehow peel off..logic leads me to believe that his theory, however analyzed, would go nowhere. In order for that theory to hold any credence at all, one would have to be able to examine it from many angles, to narrow the subject down to a plausable conclusion. Though I have no doubt this individual had many ideas and theories that he mulled over with his friends, I would like to think that he and his friends did indeed reach the conclusion that it is just ONE soul that leaves the body, instead of multiple layers. Thanks for the article Jon. I shall look into this person and his findings.